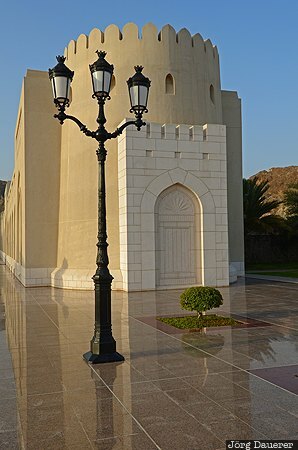 The colonnades leading to the Sultan's Palace in Muscat and a lone street lamp. Muscat is in Muscat Governorate (Capital Area) in the Sultanate of Oman. This photo was taken in the morning of a sunny day in March of 2012. This photo was taken with a digital camera.